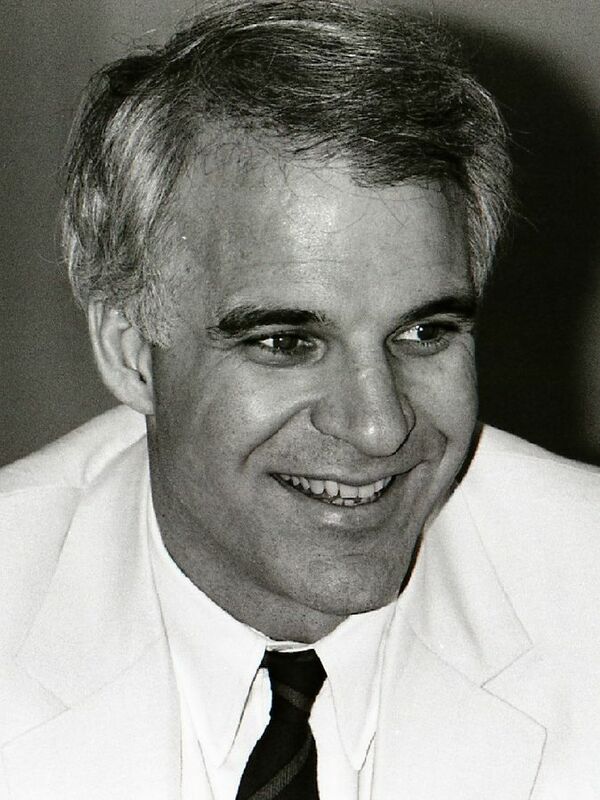 In the 1980's, Steve Martin's focus on his movie career intensified. He began to take acting lessons from Herbert Ross (a director), and learned how to tap dance for his role in the 1981 serious musical Pennies From Heaven (1981), a flop in which he again co-starred with girlfriend Bernadette Peters. Steve Martin met actress Victoria Tennant in 1982 after he and Bernadette Peters broke up. Victoria Tennant co-starred with Steve Martin in 1984's hit movie All of Me before they eloped to Rome in 1986. Below, co-stars Steve Martin, Lily Tomlin, Victoria Tennant are featured in the movie trailer for All of Me. Dead Men Don't Wear Plaid (1982), which he co-wrote with co-star and pal Carl Reiner, and George Gipe. Little Shop of Horrors (1986) had Steve Martin playing a wacky dentist. His co-stars in Little Shop of Horrors were Rick Moranis, Ellen Greene, Vincent Gardenia, and fellow Saturday Night Live alumni James Belushi, John Candy, Christopher Guest, and Bill Murray. Planes, Trains and Automobiles (1987) teamed John Candy and Steve Martin in what might be their funniest movie. Below, the movie trailer for Planes, Trains and Automobiles, featuring Steve Martin and John Candy. Roxanne (1987) which he also co-wrote and produced; Steve Martin won a Writers Guild of America Award for his writing work on Roxanne. His Roxanne co-stars included Daryl Hannah, Rick Rossovich, Shelley Duvall, Fred Willard, Michael J. Pollard, and Damon Wayans. Parenthood (1989) had a star-studded cast, in which Martin co-starred with Mary Steenburgen, Dianne Wiest, Jason Robards, Rick Moranis, Tom Hulce, Martha Plimpton, Keanu Reeves, Harley Jane Kozak, Dennis Dugan, Joaquin Phoenix, and others. Below, Steve Martin and his on-screen wife are featured in a clip from Parenthood. While filming the movie Three Amigos in 1986, Martin had begun to experience tinnitus (ringing in the ears, which many senior citizens experience as they get older) after a pistol-shooting scene; he has said he has no choice other than to cope with it. Although he was only in his 30's, his hair had already turned white making him appear more senior than his peers. Grand Canyon (1991) saw Steve Martin co-starring with Danny Glover, Kevin Kline, Mary McDonnell, Mary-Louise Parker, and Alfre Woodard. Below, are featured in the movie trailer for Grand Canyon. HouseSitter (1992) featured Goldie Hawn as the unwelcome house sitter for an unwitting Steve Martin, and Dana Delany as his girlfriend. Veteran actors Julie Harris and Donald Moffatt were also in HouseSitter. Father of the Bride (1991), and Father of the Bride II (1995), co-starring Dianne Keaton as his wife, Kimberly Williams-Paisley as their daughter and George Newbern as their son-in-law to be. Actors Martin Short, Kieran Culkin, B. D. Wong also appeared in both Father of the Bride movies. Below, Steve Martin, Dianne Keaton, Kimberly Williams-Paisley, George Newbern, Kieran Culkin, Martin Short, and B. D. Wong are featured in the movie trailer for Father of the Bride II. In the 1990s, Steve Martin also turned his writing talents to producing magazine articles for The New Yorker, and penning a stage play Picasso at the Lapin Agile (1993); the play opened in Chicago in 1993 and then ran successfully in other major cities including Los Angeles and New York City. Martin had a run of romantic bad luck in the 1990s - his marriage to Victoria Tennant began to dissolve in 1993 when Victoria became involved with an Australian TV star while filming The Man From Snowy River on location; they divorced in 1994. Steve met actress Anne Heche when she had an uncredited role in a movie he starred in - A Simple Twist of Fate (1994) - and they had a brief relationship before Anne left him for comedian Ellen DeGeneres. A brief relationship with actress Helena Bonham Carter started in 2000 when they filmed the movie Novocaine (1991 release) and ended 2001, the year she met her future husband Tim Burton. Now in his 50+ years, Steve Martin appeared in 15 movies between 2000-2009, including the 2003 comedies Bringing Down The House and Cheaper By The Dozen (and it's 2005 sequel), and The Pink Panther (2006) and it's sequel in 2009. He also starred opposite Tina Fey and Amy Poehler in 2008's Baby Mama. Below, the movie trailer for Cheaper By the Dozen features co-stars Steve Martin, Bonnie Hunt, Tom Welling, Piper Perabo, and Ashton Kutcher. 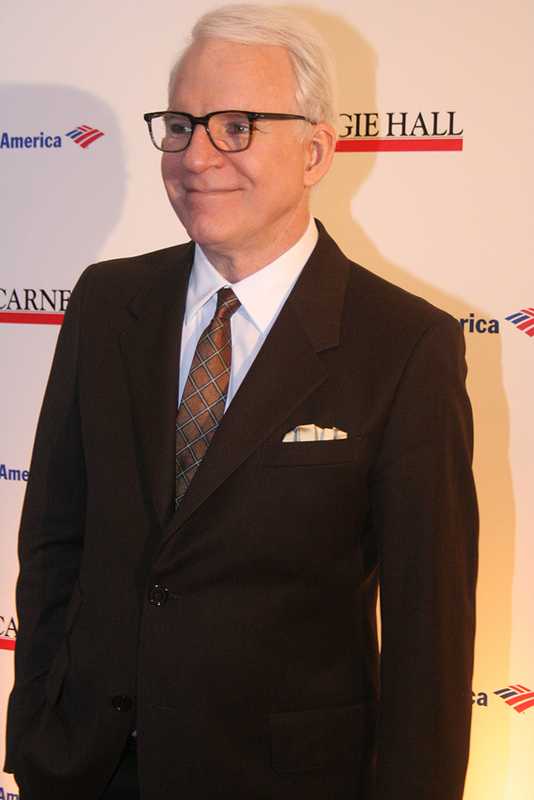 During this era Steve Martin adapted the Carl Sternheim play The Underpants: A Play into an off-Broadway play (2002), wrote the novel The Pleasure of My Company (2003), a children's book The Alphabet from A to Y with Bonus Letter Z (2007), and his memoir Born Standing Up (2007). In addition, he wrote, starred, and produced the 2006 movie Shopgirl, which was shown at film festivals and in theatres to positive critical acclaim. Martin was also a highly popular host of the Academy Awards show in 2001 and again in 2003; and on Saturday Night Live in 2006 and 2009. Below, 55+ Steve Martin's opening monologue from the 2001 Academy Awards. Steve Martin had begun collecting art in 1968 and by 2001 had acquired enough significant works of art for an exhibit of 28 pieces by name artists such as Picasso, Hockney, and Hopper; he subsequently sold Hopper's Hotel Window at auction in 2006 for $26.8 million. Music was becoming increasingly more present in Martin's career at the beginning of the 21st century. He played banjo with Earl Scruggs on a remake of Foggy Mountain Breakdown (2001), which won a Grammy Award for Best Country Instrumental Performance. His 2009 album The Crow: New Songs for the 5-String Banjo, was produced by his long-time friend and John McEuen. This was Steve Martin's first all-music (non-comedy) album and won the Grammy Award for Best Bluegrass Album. That year he debuted on The Grand Ole Opry, the beginning of live solo and other performances on stage. Below, Steve playing banjo at the Highline Ballroom in 2011. In 2010, the year Steve Martin turned 65 and became a senior citizen, he co-hosted the Academy Award show (his third time at hosting it) and wrote his second children's book Late For School, and second novel An Object of Beauty. That same year, Martin appeared with the Steep Canyon Rangers at bluegrass festivals and on talk shows. He founded an annual award to reward and recognize artistry in bluegrass performers - the Steve Martin Prize of Excellence in Banjo and Bluegrass. 55+ Martin met The New Yorker magazine writer Anne Stringfield, 26 years his junior, in 2004. After three years of dating they married in 2007 at a surprise ceremony at his L.A. home, with SNL creator Lorne Michaels as his best man. In December of 2012 at age 67, when many senior citizens are becoming grandparents or even great-grandparents, Steve Martin became a first-time dad when he and Stringfield had a baby girl. Their daughter's name has not been shared with the public, reflecting Martin's desire for privacy in his personal life. Below, Martin receiving an Honorary Award at the 2013 Governors Awards and talking about his appreciation for his career, his wife and child, and his many lifelong friends. Steve Martin shows no signs of slowing down in his senior years. He appeared in the film The Big Year (2011) before taking a three-year break from the movies. During this break he continued to focus on music, making appearances with the Steep Canyon Rangers and narrating Give Me The Banjo (2011), a PBS documentary. 2012 was a big year for Steve Martin; earlier in the year he hosted another Saturday Night Live episode, and a collection of his tweets were compiled into the book The Ten, Make That Nine, Habits of Very Organized People. Make That Ten: The Tweets of Steve Martin. Martin began a musical collaboration with singer Edie Brickell in 2013, releasing an album Love Has Come For You and touring; the title track from the album won a Grammy Award for Best American Roots Song. 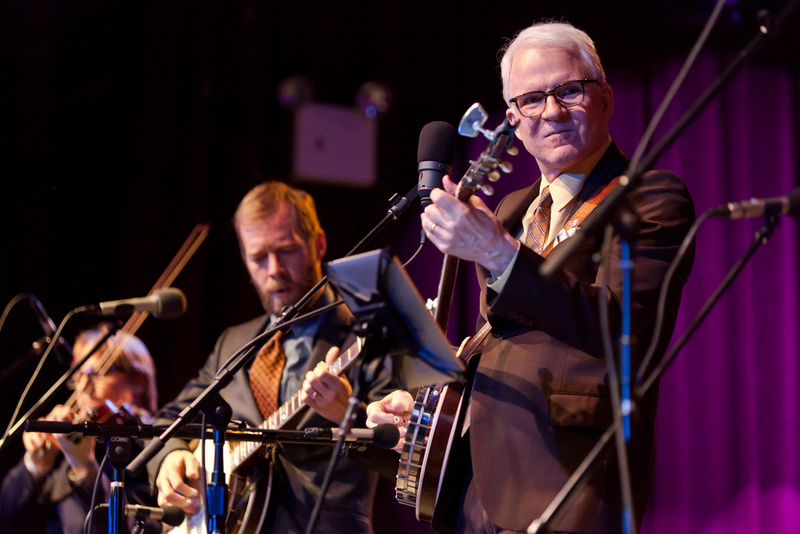 Below, Steve Martin on Ellen DeGeneres in 2011, talking about his album with the Steep Canyon Rangers, beginning to tweet, bird-watching (from The Big Year), and staying fit as a senior citizen, with hiking and biking. "I would say that as you get older, your sense of humor becomes less vicious, at least in my case. Edgy humor is better left to younger people who can afford to be less sensitive. As you get older, you know people who died, you know people who got diseases, you've had things yourself, you know what pain is and so you tend to identify with your victim a little more. You can still be edgy, it's just not as vicious."